The mural focuses on a high climber just after he has limed and topped a spar tree. Although the work is hard and dangerous, the man stops for a moment to contemplate his view. The thoughts of the man perched high on a tree looking out on the forest are left for the view to imagine. 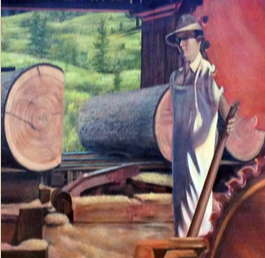 This image explores several aspects of timber cutting that are integral in a depiction of the logging industry; the beauty of the landscape, the nature of the work itself, and the interaction between these two elements. 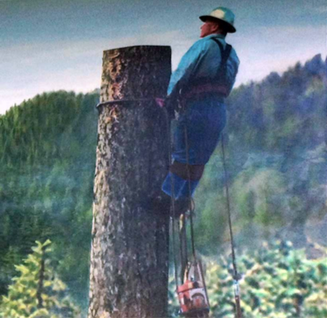 A working man, connection to his tools, begins the process of harvesting wood from a Doug Fir forest. After the spar tree is rigged, cut timber can be moved to the staging ground and then transported to the mills. Although this image illustrates only the beginning of the process, it stands as a symbol of the danger, professionalism and satisfaction of an honest day’s work in this industry, experiencing the view after felling the top of a Douglas Fir tree.